Meteor Vineyard is the confluence of an extraordinary Cabernet vineyard in the southeast corner of Napa Valley, the entrepreneurial vision of internet pioneer Barry Schuler and wife Tracy, the viticulture history and expertise of Mike Wolf and the consummate winemaking talents of Bill and Dawnine Dyer. Meteor started as a dream 35 years ago when Barry Schuler, a college student with an emerging passion for wine, first visited Napa Valley. After roaming the valley and tasting, he was struck by the burning desire to someday live in Napa, grow grapes and make wine that could take its place among the World’s greats. At that time Napa itself was emerging as a truly World Class wine making region and winemakers Bill and Dawnine Dyer were launching their careers as the history of Napa wine was being written. Little did they know that more than three decades later they would all come together in a project centered on the fruit grown in one of Napa’s most unique pieces of land – Meteor Vineyard. 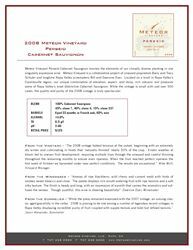 In 2003 the Dyers and the Schulers decided to produce a very small quantity of 100% Meteor Vineyard wine, to discover what a singular expression of the vineyard would be. The results were so impressive that they decided to make Barry’s 35 year old dream come true. In 2004 they bottled 40 cases for friends and family. The extraordinary quality of the 2005 vintage fruit solidified the vision and became the inaugural release from the winery. Meteor is certified under the Napa Green Winery Program by the Napa County Department of Environmental Management (DEM) and the Association of Bay Area Government’s (ABAG) Green Business Program and completed all the regulatory components needed for environmental sustainability. These components included developing water and energy conservation methods, preventing pollution, and reducing solid waste. In addition to developing sustainable winery practices, this program is set to become the standard for the state of California. Meteor is certified under the Napa Green Certified Land Program. Meteor has created and implemented a customized farm plan with measured results that addressed all aspects of its property, vineyard land as well as non-farmed land, including practicing soil conservation, water conservation, stable drainage, riparian corridor enhancement, fisheries and wildlife habitat enhancement and long-term improvement and sustainability.